Halloween is such a special time of the year for me. It marks the start of the holiday season and allows for family traditions to be made. Now that I have an active toddler, I cannot wait to dress him up as Jack from The Nightmare Before Christmas and start our very own tradition of doing as many Halloween activities as possible. Miami may not be Jack ’s town of Halloween, but we do have plenty of events in our area to make him feel right at home. 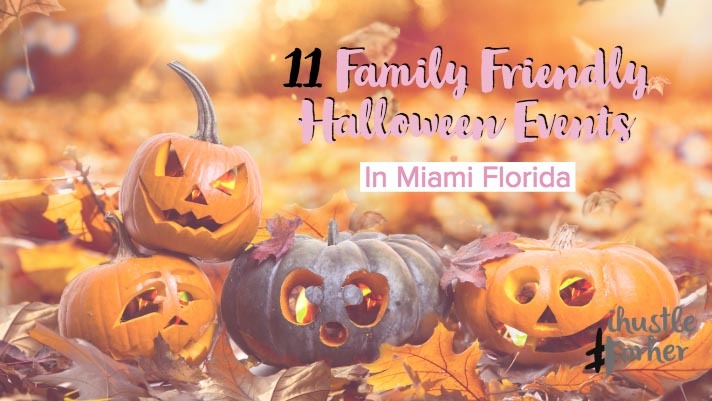 If you don’t know where to take your little ones for all of the Halloween fun, keep reading for eleven family-friendly Halloween events in Miami. 1. Kiddo-Ween Party at The Falls on October 20th, 2018. This children’s Halloween party will feature safe trick-or-treating, character appearances by superheroes and princesses, scavenger hunt, scary faces photo booth, and an amazing Pumpkin Path station. There will also be will also be able to enjoy a fun zone with face painting, balloon artists, arts, and craft, bounce house, costume contest, music, giveaways, fun and much more! This is one of Miami's Largest Trick or Treat parties! Join Roary for a Halloween celebration as FIU Football takes on Rice with kickoff at 7:30 PM. The City of North Miami's Annual Halloween Haunted Trails and Kids Fun Zone Friday, there will be Scary hayrides, haunted trails, kids zones, a costume parade, and Food for purchase from Local Vendors. Bring the kids to the IKEA Restaurant for Halloween fun from 4-6pm. They encourage children to come dressed in costumes. At the even,t they will have craft activities, costume parades, and other fun surprises! This activity is an exclusive benefit for IKEA FAMILY Members. Show your IKEA FAMILY Member card at the activity to participate. 5. Zoo Boo at Zoo Miami on October 27thand 28th2018. This Trick-or-Treating event invites families and kids ages 12 to trick-or-treat in costumes, participate in costume contests, watch special performances, make Halloween crafts, see our wild animals get their Halloween goodies, and more! 6. Trunk & Treat at Fairchild Tropical Botanical Garden on October 28th2018. Join them for a day of fall fun as they welcome Cars in the Garden, with a Halloween twist! Trick-or-treat through the cars, see how the cars and their owners dress up or stay for the car parade at 4:00 p.m. to see the cars parade out of the Garden! 7. Halloween Family Boo Bash at the Cauley Square Historic Railroad Village on October 28th2018. Bring family friendly spooky day full of excitement. Guest are welcome to trick or treat at our historic railroad village. Many fun children's entertainment such as face painting, balloon art, tattoos, arts & crafts, pony rides, petting zoo, magic mirror photo booth & more. Kids 12 and under can participate in our costume contest, don't miss our spectacular magic show and DJ. Daily food specials at our restaurants onsite. For more info: halloween-family-boo-bash 8. Spooktacular Safe Streets Halloween Party on October 31st2018. Don't miss the City of South Miami and Miami Kids Magazine's Safe Streets Halloween Block Party! The party will be from SW 72nd St. to 57th Avenue. There will be safe and fun trick or treating for the whole family! Enjoy a visit from Dr. Seuss's the Cat in the Hat, free candy, games, prizes, music, pumpkin painting, inflatables, and much more! Pick a costume theme for the whole family. 9. Halloween On The Mile on October 31st2018. 10. Spooktacular Halloween Party at Dolphin Mall on October 31st2018. Enjoy safe family friendly trick or treating around the mall, face painting, balloon artists consume contest and much more. 11. Halloween Boo Bash at the Mall Of The Americas on October 31st2018. The Mall of the Americas’ annual Halloween Celebration is for children ages 10 and under. Enjoy fun games with the friendly, bilingual Gigi the Witch. We will be attending Kiddo-Ween Party at The Falls and the Spooktacular Safe Streets Halloween Party in South Miami. Follow me on Instagram @jamnetty to see all of the fun we get into. Follow her on Instagram @jamnetty to see all of the fun Halloween fun her and her kiddos get into this year.